Servos are used to control the movement of many things in your RC ship, including steering, gun depression, and firing. A servo will typically only have a movement of 90 degrees. The servos come in many sizes and torques, and choosing the correct one makes your ship operating experience more pleasant. Read more about the types of servos at the bottom of the page. Strike Models now has laser cut servo mounts for standard and micro sized servos. These easy to assemble kits allow for a near perfect fit for servos and allow for easy replacement. Glue the pieces together while a servo is wrapped in a single layer of wax paper. After the glue dries, pre-drill the holes for the screws to hold down the servo. Then just glue or epoxy the mount to where ever you need it. The wax paper prevents gluing the servo to the mount and provides a needed space to allow the servo to easily go in and out. The sides of the mount are cut such that the servo cable will not be a problem. Did you find this page via the Black Rock City Navigator post? The servo described there is the VS-2 Standard Servo. This micro servo is comparable to the Hitec HS-82 MG. This servo is not quite as strong, but does have metal gears. Its form factor makes it useful for steering small ships and gun depression.The VS-3M micro servo has a Hitec spline and includes a cross horn, circular horn, and a double side horn. This metal gear servo was designed for airplane wings. As a result, the case is thinner (it uses a coreless motor), the mounting points are different, and it has a hole running through the case parallel to the servo arm axis. This can allow the servo itself to pivot if a long pin (1/16th inch) is run through the hole. This is likely not as good for steering because of the mounting points, but should be very good for gun depression and other places where you cannot otherwise fit a servo. 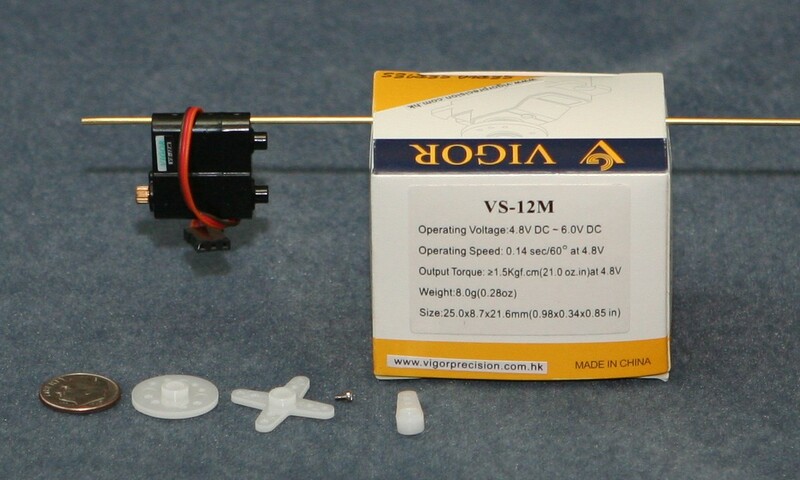 The VS-12M lightweight servo has a Hitec spline and comes with a cross horn, circular horn, and single side horn. This is the standard sized servo with standard torque output. When an ordinary servo will work, this is the one to use. 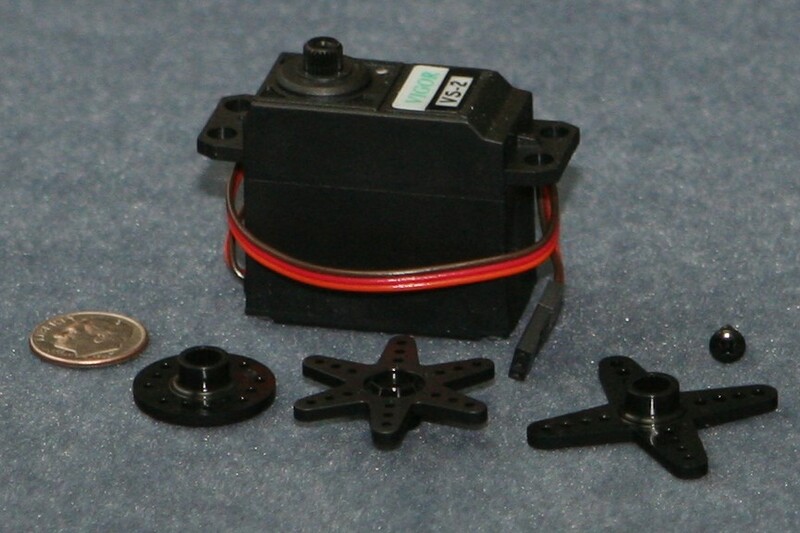 The VS-2 servo uses the Futaba spline and comes with a cross horn, star horn, and a circular horn. This is a heavy duty servo in a standard case that has been made water resistant with the inclusion of many o-rings. This servo has the same form factor as the VS-2, but has almost twice the torque. The case largely consists of an aluminum heat sink (viewable in the picture) that strengthens the case and dissipates heat. This servo includes one ball bearing. The VS-22 high torque servo has a Futaba spline and includes a cross horn, star horn, and a circular horn. This is the smallest sail winch servo we have seen. It has the same standard servo case but turns over 4 1/2 turn (in only about three seconds with no load). The VSD-22YMB is the strongest servo we stock as well as being the only digital servo. It is only a little less powerful than then Hitec HS-785HB but is a fraction of the size and weight. If you need a sail winch servo but do not have the room for the more popular servo, this is definitely the way to go. 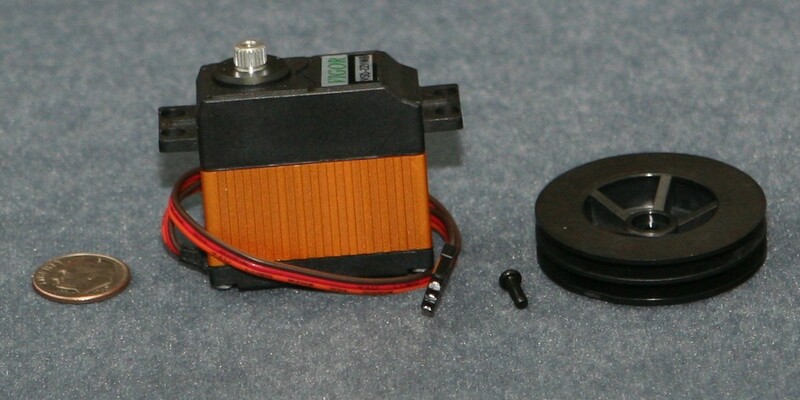 The case for this servo is identical to the VS-22 (including water resistance), but it comes with a dual track pulley (42 mm outer diameter, 30 mm pulley inner diameter). The standard set of servo horns are not included (only the pulley). The spline style is Futaba. This servo incorporates 5 metal gears, two sets of ball bearings, and a coreless motor. A standard servo is just that: standard, decent torque, and not small. These servos are the cheapest and are typically used unless there is reason not to do so (like not enough room or not enough torque). They are used in many parts of your ship, such as pneumatic button pressing (for firing guns), steering, and gun depression (mainly big gun cannons, and only if they fit). 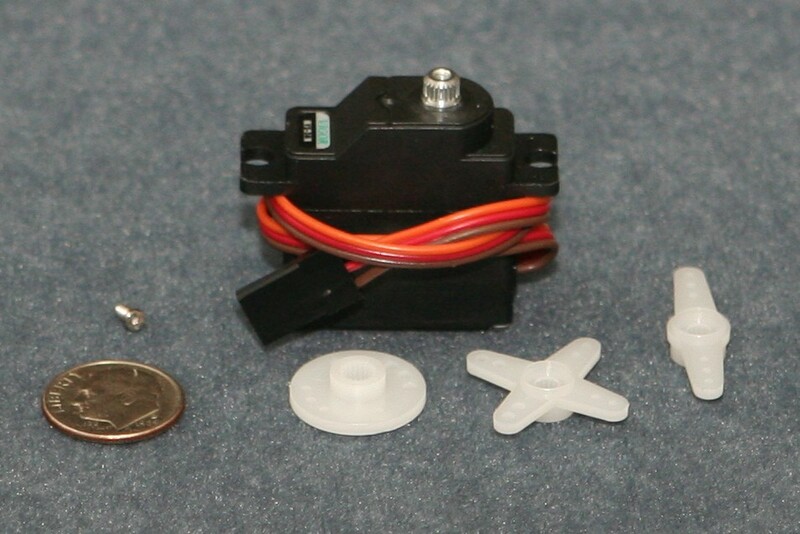 Micro servos (or mini servos) are smaller than standard servos and cannot generate as much torque. The ships use them for gun depression (big gun) and steering for smaller cruisers and destroyers. If used for steering, make sure the servo has metal gears. Micro servos without metal gears that used for steering have a nasty tendency to strip gears at inopportune times. Sail winch servos are unique in that they travel more than 90 degrees (often four or more full rotations), and are often significantly more powerful than a standard servo. They were originally designed for sailing boats so the sails can be moved. In our hobby, sail winch servos are typically used for turret rotation – turret rotation is rare in fast gun ships but quite common in big gun. An alternative to sail winch servos is what is known as a hacked servo. A hacked servo lacks the feedback of a servo, and so merely moves clockwise or counter-clockwise without end. Hacked servos are also common for turning turrets. Typically, hacking is done to a standard servo. 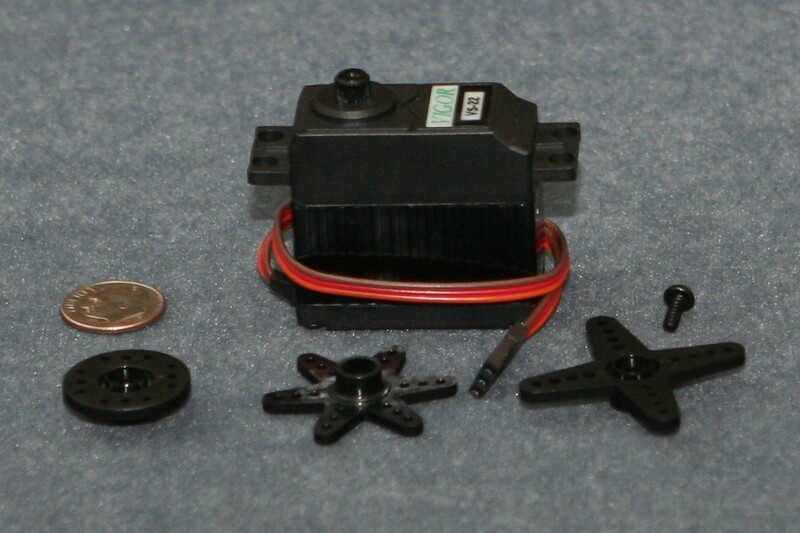 Most servos come with a selection of arms (known as horns) that are used to connect the servo to whatever it is you want moved. The typical types are the cross horns (which look like a big X), the circular horn (a disk with many connection points), the star horn (similar to the cross horn, but with 6 arms), the double side horn (pretty much a stick with connections on either end), and a single side horn. The spline that the horns attach to are generally either the Futaba or Hitec style (which are not compatible with each other). All of the servos listed here are from Vigor Servo, a division of Vigor Precision LTD.